As more and more people explore the wonders of Asia and the Orient, Vietnam has become a popular tourist destination for global travelers hoping to catch a glimpse of the unspoiled treasures the country has in abundance. Vietnam itself is a beautiful country. Modern cities and nearly untouched rural villages and sites are juxtaposed on this long, slender curve of land bordered on the east by the South China Sea and on the west by the countries of Laos and Cambodia. Halong Bay is located on the northern coast in the Gulf of Tonkin, about 180km (106 miles) from Hanoi, with a travel time of between three to four hours along a fairly straight and level piece of road (though it can be bumpy!). You can also find 30-minute flights between Hanoi and Halong Bay that reduce exhausting travel time, leaving you with more energy and available hours to explore the bay and its sights. Even the locals do not consider a trip to Vietnam to be complete until you have visited this beautiful place and have been able to drink in the sight of the vegetation-topped limestone karsts and islets jutting out of the emerald green water. Whether there is a light mist or the sun is shining, it is a singular experience to glide between the karsts as if through a gigantic maze. 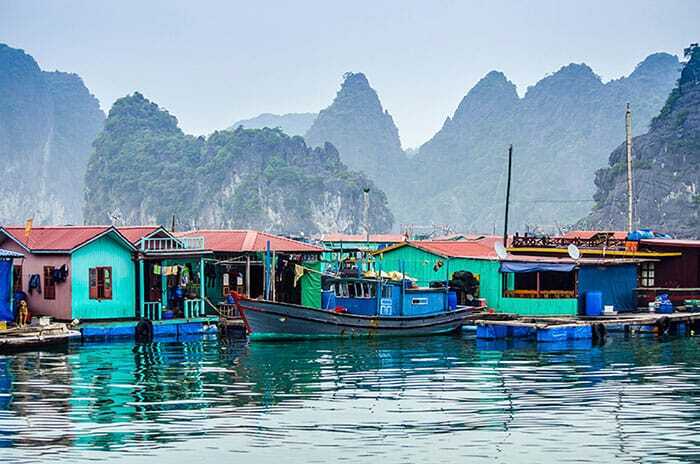 While Halong Bay has been an extremely popular nature site among global tourists for at least a couple decades now, crowds and boats don’t take anything away from the awe-inspiring scenery. Once on the water, you can truly enjoy the tranquility of this ancient and mystical place. 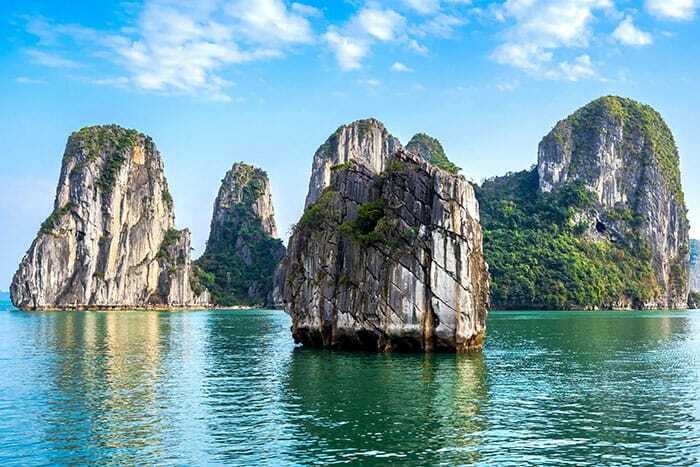 Halong Bay has a long and storied history among the Vietnamese people. The bay waters themselves support a remarkable number of marine species, including 200 species of fish and over 450 species of mollusks. The over 1600 karsts and islets are home to hundreds more species of animals and birds. Fishing boats have plied the waters here for centuries, and floating fishing villages that farm fish, shellfish, and pearl oysters are now a regular stop on many cruise boat tours. Archeologists have discovered human habitations within the caves of the karsts and have placed the earliest settlers here about 25,000 years ago. The water level rose to cover the floor of the bay, leaving only the jutting cliffs above the sea’s surface. Halong Bay’s Vietnamese name, Vinh Ha Long, means “bay of the descending dragons.” Legend tells the story of the earliest settlers to the land, who were worried and harassed by invaders coming from the north on ships into the bay. Seeing the plight of the people, a family of compassionate dragons swooped down over the bay and spat chunks of emerald and jade from their mouths to block the invaders’ ships. The dragons’ intervention saved the people, and the invaders were repelled, their ships destroyed. The dragons decided to take human form instead of returning to heaven, and they continued to love and serve the people for years. Over time, the emerald and jade walls turned into the limestone karsts that we see now. 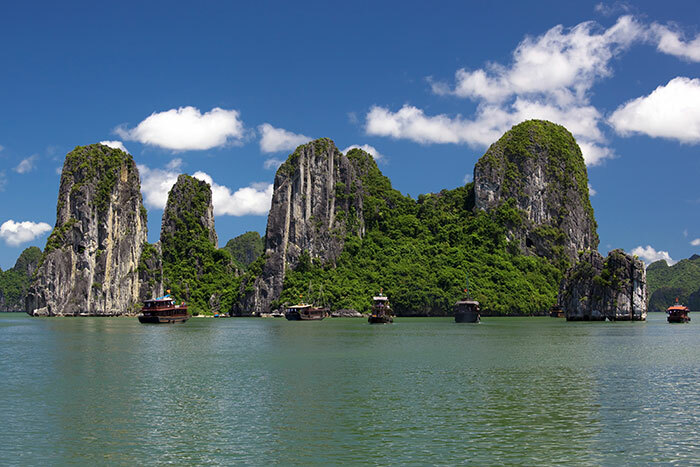 Most of the islets that are centered in Halong Bay are made of limestone and are examples of drowned limestone karsts. Because limestone is highly porous and soft, it is easily susceptible to the carving forces of water, and the water level has risen and fallen dramatically in the bay over millions of years. The two main types of limestone formations that make up the karsts are fengcong (which contain clusters of conical peaks) and fenglin (isolated towers). Most of the karsts are uninhabited (except by dozens of species of animals and birds) because of their sheer, cliff-like sides, but several islands are large enough to support small cities, such as Cat Ba Island. Within the centers of some karsts, the water has carved out fantastic caves, several of which have been turned into tourist destinations. On others, you will find hidden lakes. Jungle vegetation flourishes on the karsts in this tropical climate. Halong Bay was made a UNESCO World Heritage Site in 1994, and in 2012, it was given a spot on the New7Wonders of Nature list. 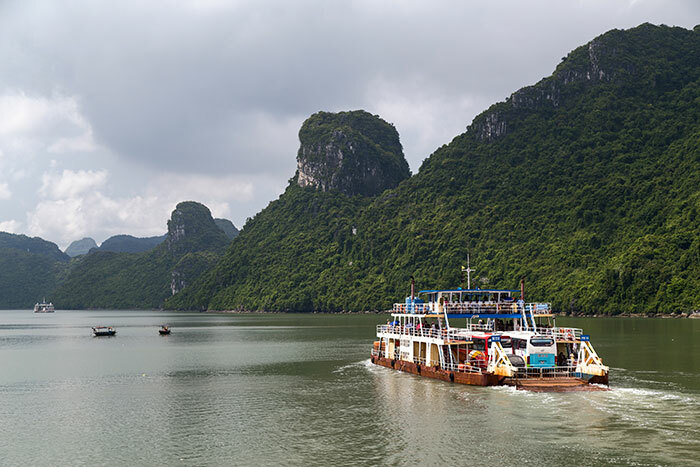 Taking a cruise on the water among the karsts is one way to see the beauty of the bay, but Halong Bay is also home to numerous caves and other wonders. 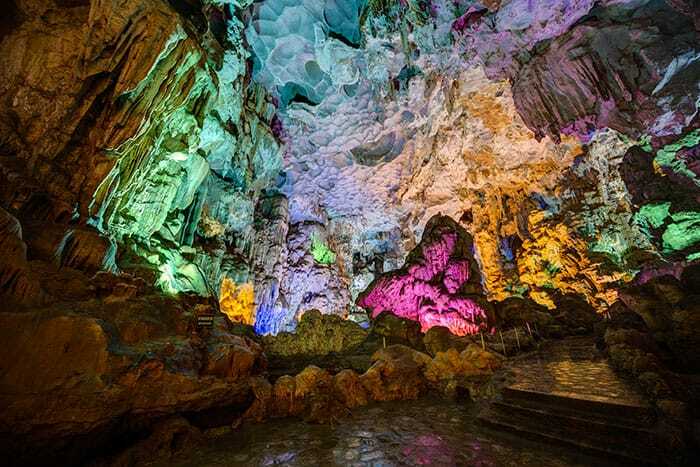 One of the most famous of the Halong Bay sites is Sung Sot Cave, located on Bo Hon Island. A huge cavity, the cave is around 10,000 square meters large and contains three rooms or partitions, which are linked by a smooth walkway. Each of the rooms contains hundreds of stalagmites and stalactites. 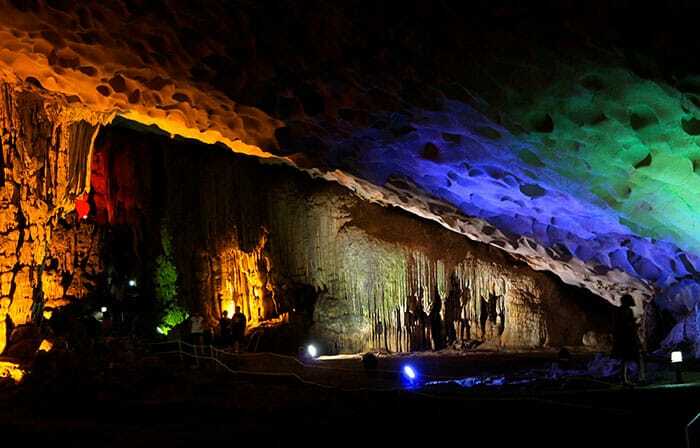 Most of the cave is colorfully lit with artificial light that highlights the rocky walls’ interesting features, and a knowledgeable guide can give you some great insights into the cave’s history as well as helping you find the mystical shapes and figures in the cave’s walls. The last room is lit by hazy sunlight streaming through a natural skylight in the cave’s ceiling. The 100-foot ceiling is solidly supported by a fantastic rock pillar. The skylight also acts as the cave exit. The approach to the cave is a series of steps. The first series of steps climb up to the mouth of the cave itself, and the second series drops you down to the cave floor. You will also need to climb steps in order to exit the cave. If you have trouble walking or climbing, be aware of this fact. Cat Ba Island, one of the largest islands of Halong Bay and one of the bay’s only populated islands, is the most popular overnight destination for multi-day cruises. Home to six communities and around 13,000 residents, half the island has been designated as a national park. Cat Ba town, on the southern tip of the island, is home to most of Cat Ba Island’s residents as well as its hotels, motels, and restaurants. The town continues to grow as more hotels and resorts are built to accommodate the more than 350,000 visitors it hosts each year. Visitors can enjoy the island-wide free wi-fi as well its beautiful national park, home to the endangered and endemic Cat Ba langur. You can also visit Hospital Cave, which served as a bomb-proof hospital during the Vietnam War, and Cannon Fort, which gives you a stunning view of the island and nearby Lan Ha Bay. According to legend, Cat Ba was named after three Tran Dynasty women who were killed, their bodies thrown in the sea, and whose bodies washed up on three different beaches of the island (Cat means sandy, and Ba means women). The bodies were found by fishermen, who then built three temples to honor each of the three women. 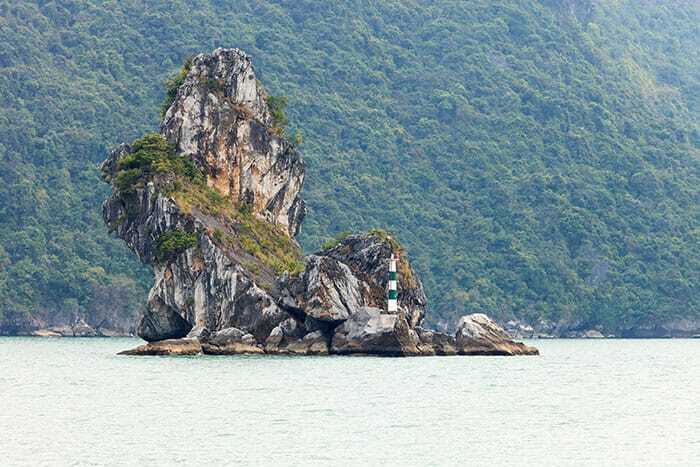 Massive Dau Be Island stands as a sentinel in the southeast part of Halong Bay. The island’s sheer mass is enough to help prevent surge waves from the east from entering into the bay. The interior of Dau Be Island contains magical Ba Ham Lake. Accessed only by kayak or canoe through a rocky tunnel into the island’s interior, the lake is comprised of three round pits joined by a meandering path. The walls around the lake are nearly vertical cliff faces, home to a diverse population of flora and fauna, including yellow-haired monkeys. 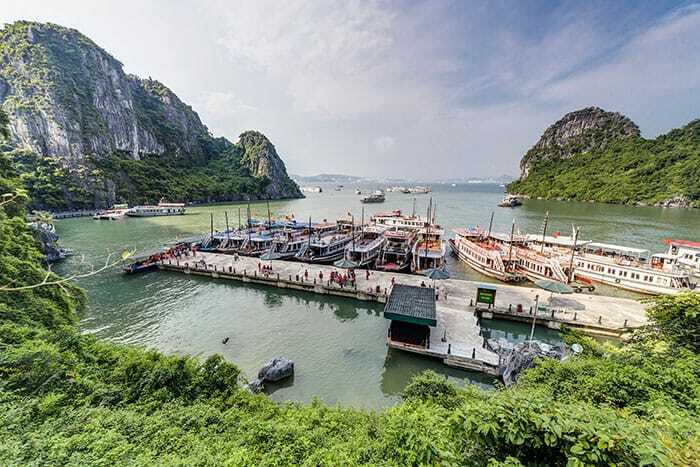 The second of Halong Bay’s most famous caves, Dau Go is located on Driftwood Island, so named because a 13th century general hid ironwood stakes here before planting them in the bed of the Bach Dang River to founder the ships of Yuan-Mongolian invaders. The cave itself is massive and contains three main parts as well as dozens of naturally ornamented stalagmites and stalactites. Natural and artificial lighting helps highlight the curious forms on the walls and stalagmites and stalactites, suggesting human and animal figures. Much like Sung Sot Cave, entry to the cave includes two series of steps—one up to the mouth and one down to the floor of the cavern. Fishing is an ancient trade in Halong Bay due to the bay’s very diverse and numerous species of sea life. Today, fishing families have created floating villages by lashing together a series of boats and wooden walkways. These villages specialize in farming the fish in the bay as well as tending oyster beds for their pearls. Cruise boats often include a stop at a fishing village as part of the itinerary, and visitors can speak to the villagers, purchase fresh seafood (and have it cooked to order on their boats), or browse through the selections at the gift shop. The best way to visit and enjoy Halong Bay is to take a cruise. Cruising boats are plentiful, so there are many options when it comes to choosing which one will best suit your budget and your traveling situation. If you are new to Vietnam, do some research before booking a cruise to make sure you are getting a safe boat, an itinerary that will allow you to stop at the places you want to see, and the eating and sleeping arrangements that are satisfactory to you. Cruise boats range from dilapidated old hulks that cram in the day-trippers to elegant junks and ships that cater to your every need. Along with the variety of boat and operator standards, you’ll find a variety of prices. Cruises are grouped into one of the following categories: day trips; two day/one night; or three day/two night excursions. The province does not have strict standards of safety for cruise boats, and people have lost their lives when old, unsafe boats spring a leak and go down in the bay. You will get more consistent standards of service with the established cruise operators, such as Paradise Cruises, Emeraude, Indochina Junk, Emotion, Oriental Sails, or Bhaya. There is nothing wrong with getting a discount cruise, but make sure you ask what the itinerary is. Budget cruise operators often change the itinerary on a whim in order to cram more people onboard. If you have a flexible schedule and a laid-back temperament, you’ll see these changes as more of an adventure than an annoyance. Budget cruises are the one- and two-star cruises. They generally cost little, but you will get the service, food, and accommodations you pay for. Budget cruises are better for single travelers, couples, or very small groups with no small children, a flexible schedule, and no physical impairments (you may be asked to cross several boats to get to your cruise boat or back to the dock). Mid-range cruises fall into the three-star category and are ideal for those without a large travel budget but who want good food and accommodations as well as those traveling in family groups and/or with children. Most people choose a mid-range cruise as the best compromise between budget and comfort, and you can get a great cruise this way. Deluxe cruises are the four- and five-star experiences, which can be luxurious indeed! 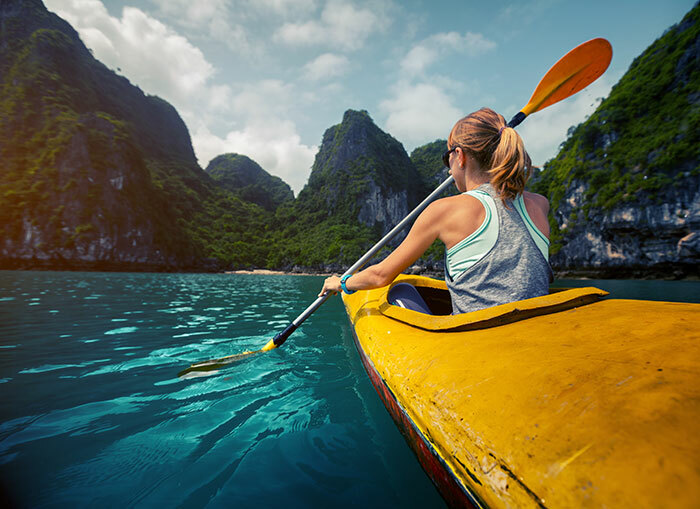 Deluxe cruises offer exquisite service, beautiful accommodations, elegant and delicious food, and extra amenities like cooking classes, dinner in one of the famous caves, or private kayaking and swimming experiences. Cruising in this kind of comfort can cost you, but it is a very good option for senior citizens with mobility problems, family groups, and those who like consistency and predictability. You don’t have to stick with a cruise company to get the most out of a trip to Halong Bay. Adventurous and experienced travelers can cobble together a DIY experience in order to get exactly what they want without being hampered by others’ schedules. Mini-buses, buses, and taxis all offer transportation to and from Hanoi and Halong Bay, where you can haggle with cruise operators at the wharf to get a good price to your destination—or get a bus-ferry-bus ticket directly to Cat Ba Island and bypass Halong Bay City entirely. 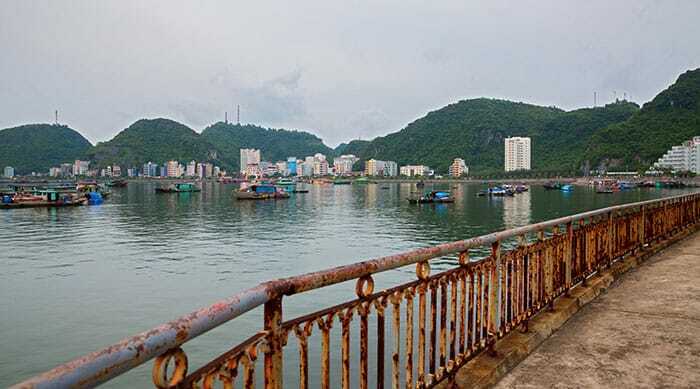 DIY travelers can decide whether or not to stay in Halong Bay City before boarding a boat to take them to Cat Ba Island or other Halong Bay destinations. The only caveat is that you will need to pay for each meal, site, or activity separately rather than getting a package deal on a cruise boat, but you will also be free to choose where to go and how long to stay. 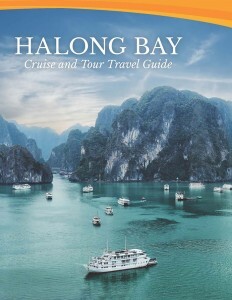 You have two options for booking your cruise in Halong Bay: online or in person. There are advantages and disadvantages to both. Booking online allows you to view images of the boat’s rooms, dining area, and food offerings. It also allows you to see the itinerary and make any special requests you may have. But booking online does not allow you to negotiate a price, so you will pay top dollar for your cruise. If you want security and stability, however, the money is well worth it for the peace of mind that you are traveling with one of the established, stable cruise operators. Be aware that high-end deluxe cruises fill up quickly, so book as far in advance as you can to secure your spot. 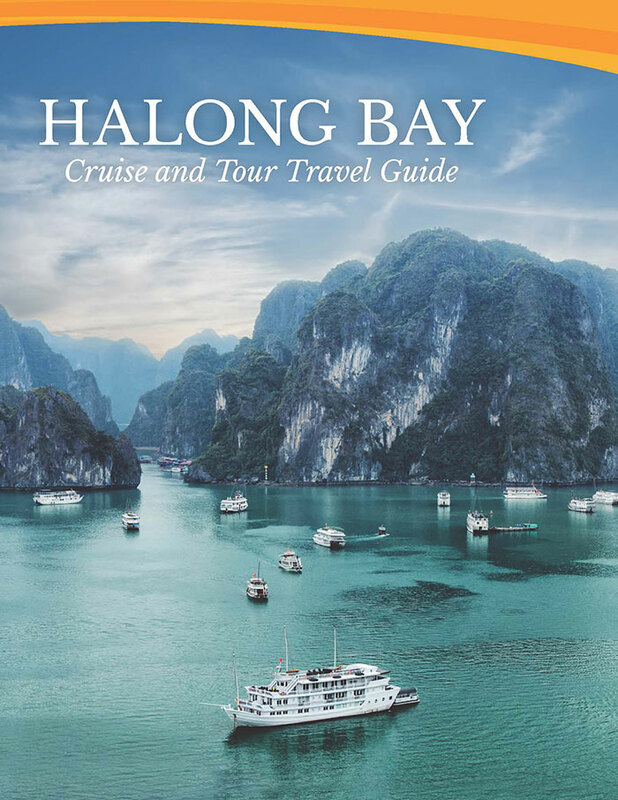 To save money, you can book a cruise in person either in Hanoi or one the wharf of Halong Bay City (negotiating on the dock is an adventure and should not be undertaken when you have very small children in tow). Most Hanoi hotels have a desk at which you can view and book cruises, and while you might pay a few more dollars than going to a travel agent and haggling over price, you won’t have to worry about any bait-and-switch situations. Plus, it’s faster and easier than running from travel agency to travel agency. If you love to negotiate a bargain, you can ask hotel staff for recommendations for good travel agencies and then go directly to the travel agency to book a cruise. This allows you to haggle over the price a bit and find the best cruise for the best price. Hanoi is full of travel agencies, so don’t be afraid to shop around and get an idea of a good price for the type of cruise you want. Reputable travel agencies are your best bet here. Nearly all travelers to Vietnam will require a visa in order to explore the country. Fortunately, visas are not difficult to obtain. 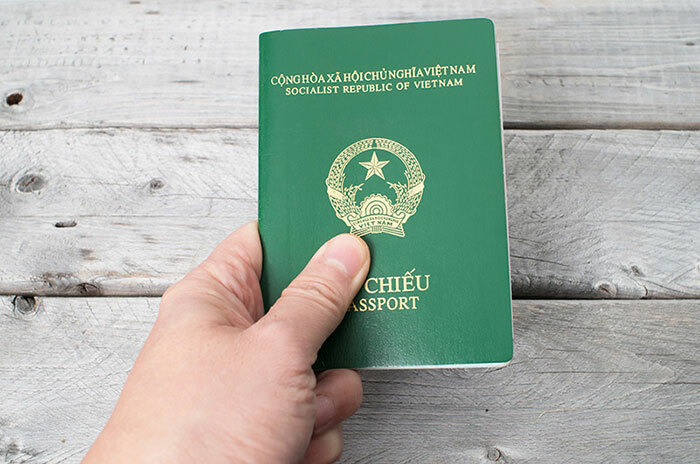 Any Vietnam embassy in the world offers travel visas within about five business days, and you can also apply for a visa online and have it waiting for you at one of Vietnam’s three international airports. Applying online is usually the quicker route because you can have your Letter of Approval and visa within two business days at a very reasonable cost. Although visas can be issued on an emergency basis, it’s a risky proposition. If you land on one of Vietnam’s many public holidays, you could be out of luck and will either have to fly out of Vietnam or wait in the airport for a visa to be approved. The better option is to plan ahead and obtain a visa at least two weeks in advance of your arrival date. A trip to Vietnam is not complete without a visit to Halong Bay. Halong Bay is a magical, mystical place with its hundreds of limestone karsts jutting out of an emerald green sea. The waters are teeming with fish, and the jungle vegetation of the karsts and islands are alive with a wide array of animals and birds. 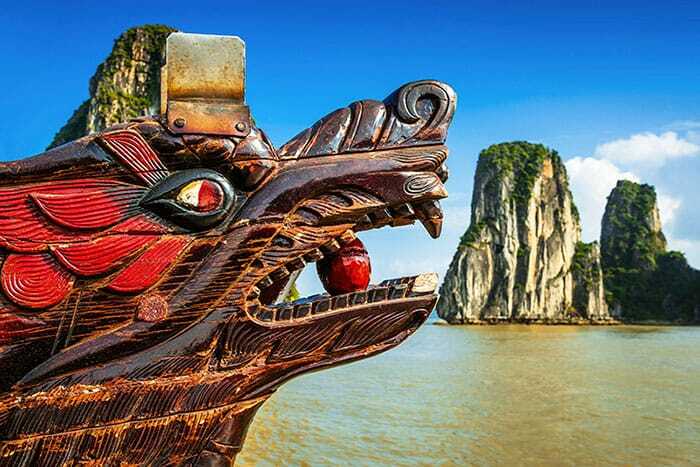 The legend of Halong Bay includes benevolent dragons who protected the first settlers in the area from invaders from the north. The best way to enjoy Halong Bay is on a cruise. Cruises are available as one-day, two day/one night, or three day/two night excursions. Cruises range from budget to deluxe, and your selection of which type of cruise will depend on your travel budget and needs. Mid-range cruises (3-star) are the most popular because they offer a great experience without a high price tag, but you can find cruises for just a few dollars all the way up to hundreds of dollars per person. 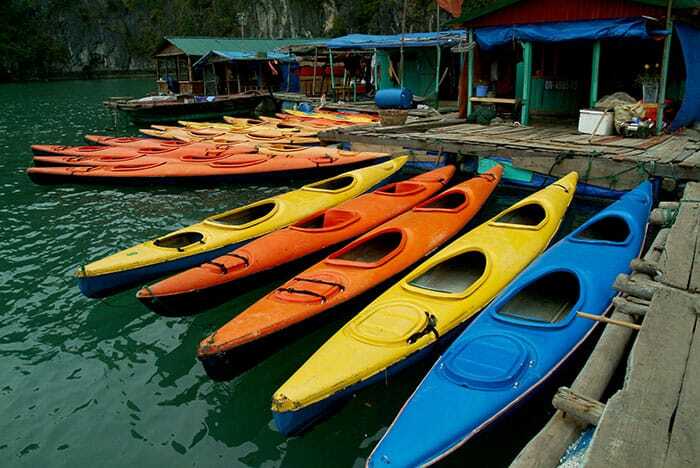 It is also perfectly possible to put together a DIY tour of Halong Bay, the famous caves, Cat Ba Island, and more. You will need a visa to enter and tour Vietnam. Visas are readily available through Vietnamese embassies or online within just a few business days and are very reasonably priced.